By the time you read this Westport United could have joined Straide and Foxford United and Manulla at the top of the table on 16 points, or Castlebar Celtic could move just one point behind the two table toppers and just into third place over Westport United by a point. The two grand old clubs of Mayo soccer met in Celtic Park yesterday evening in one of the most eagerly anticipated clashes so far this season. Also in action last night were fifth placed Claremorris and a bottom of the table Ballina Town, a game Ballina really need to pick up some points in as they look to pull themselves away from the relegation battle. Last Saturday evening, Claremorris put an end to Celtic's winning streak thanks to goals from Derek Glynn and a Andrew Peters double to claim the points with Jason Hunt and Liam Flatley hitting the back of the net for Celtic in the 3-2 win for the south Mayo side. After their game on Thursday night, Claremorris will be facing another stiff test when they travel to Green Road to take on Straide and Foxford United. 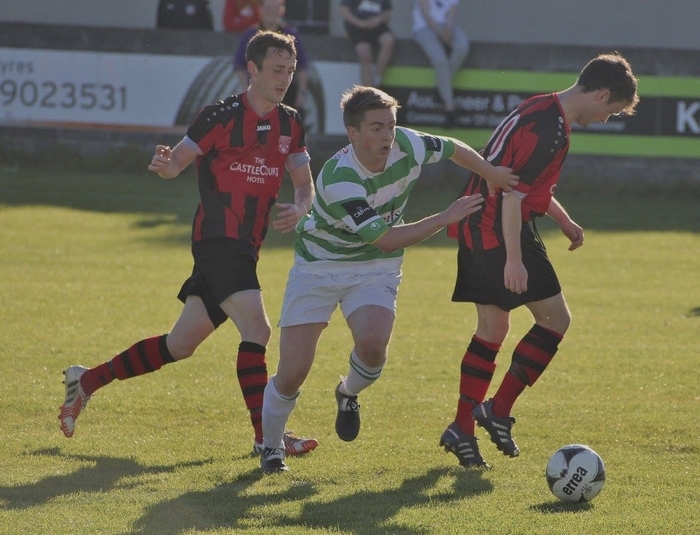 Last weekend United picked up their fifth league win of the season with a 3-1 win on the road against Glenhest Rovers. John Durkan struck twice with Chris Moore hitting the third as the newly promoted outfits dream start to the season continued. Westport United face a short turn around this weekend after last nights game they will have a west coast derby against Achill Rovers on Saturday evening at 7pm. Last wekend John Brennan's men were nearly turned over in one of the biggest surprises of the season, when a second bottom Ballyheane pushed them all the way. Ballyheane led 2-1 at the break thanks to goals from Liam Irwin and Sean Kilcoyne - having gone behind to a PJ Cawley strike earlier in the half. David Hoban was sprung from the bench by Westport United early in the second half and hit the back of the net twice after his introduction to seal the win. Achill Rovers were involved in a seven goal thriller last weekend, going down 4-3 at home against Manulla, the visitors led 4-1 at one stage thanks to goals from Chris Maughan, Padraig Mulroe, Michael Gilfoyle and Paul Lawless. But Rovers battled back hard and Cyril Guedje and Chris Western hit the back of the net to leave just one between the sides at the end. The other Super League game last weekend saw Ballina Town's woes continue as they were beaten 3-2, by Ballyglass in Keaveney Park, Cathal Noone put the visitors in front with a deft finish 15 minutes in, but Ballyglass hit back with Danny Broderick, Darren Murray and JP O'Gorman finding the net for their side, before a late Ciaran Gaughan goal made it a nervy final ten minutes for Tom Connolly's side. Page generated in 0.0719 seconds.